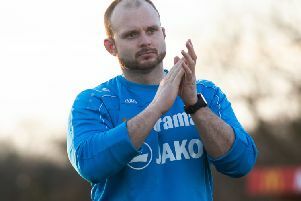 Hemel Town boss Dean Brennan labelled he performance of referee Christopher O’Donnell as ‘embarrassing’ after the Tudors saw a potentially match-winning goal ruled out against Wealdstone on Monday night. With the scores locked at 0-0 in the 70th minute, Hemel thought they had broken the deadlock through a Jack Kelly header from a corner, but the referee disallowed the goal for an alleged infringement. A lot of these young referees just aren’t good enough when it comes to the big decisions. The Tudors pressed hard for a winner, but Wealdstone held firm to earn a 0-0 draw as Hemel missed the opportunity to climb into the National League South playoff places. A clearly frustrated Brennan said: “We were robbed by the referee, it’s that clear. This referee contacts me sometimes and asks me to give him feedback on how he referees, but tonight it was a terrible decision, absolutely shocking. “They are looking for these young referees to come through, but it’s embarrassing, absolutely embarrassing. He’s disallowed a clear goal for nothing. “Even their bench has said it to me, it was a clear goal. He’s just not a good referee, and a lot of these young referees just aren’t good enough when it comes to the big decisions. “This is our livelihood. This is mortgage football. This ain’t Premier League football where the players are on millions of pounds. This pays my bills, puts food into my two boys’ mouths. “I’m really, really disappointed with the referee. He’s let us down once again. He’s had us three or four times, and every time he lets us down. He lets himself down. “He’s never going to referee at a higher standard. I don’t care if I get charged and all that rubbish because I’m being honest – I’ll show them the video evidence. It’s just a diabolical decision. The draw moved Hemel level on points with fifth placed Dartford, and Brennan continued: “We have picked up four points over the weekend despite the fact that we have no squad. We showed our DNA today, what we are like as a management team. We aren’t bad are we? “Our team were outstanding second half, absolutely fantastic. I thought they defended very well, but I thought we were excellent in posession, despite the fact that we are depleted. Totally depleted. “How we are in this situation is credit to everyone on the playing side of the football club - it’s an unbelievable situation, absolutely crazy. We had two 16-year-olds on the bench again tonight.